One day, in the early 70's, I walked into the shop of a Master Luthier named Wade Lowe. I had no idea that walking into his shop was going to have such a dramatic affect on my life. Wade was busy at his work bench carving a headstock for a guitar he was building. 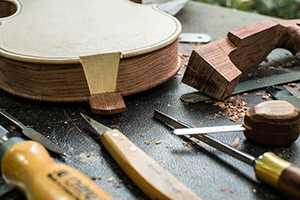 At that moment in time it dawned on me that guitars didn't just appear in retail shops…they were made by someone. Some are made in factories on an assembly line and a very few are lovingly made by the hand of a craftsman. 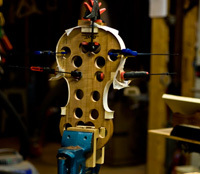 It was then that I decided I want to make guitars and violins. 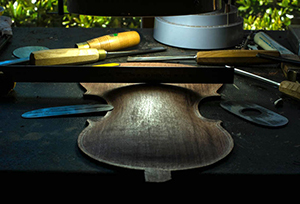 It was many years later before I was able to fulfill my dream and build my first instrument but Wade then encouraged me to start making violins and that is when I found my true calling! 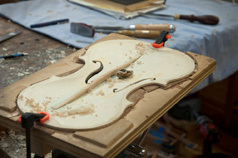 Musical instruments are "the brush and canvas" which musicians use to create their masterpieces. I am a "so-so" musician but I can build great instruments that allow talented musicians to bring joy to all that hear them. 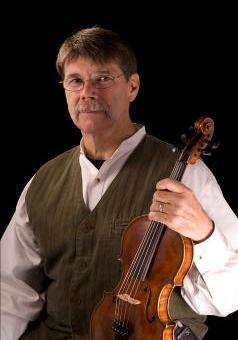 Let Barry Dudley build you violin that will help you can create your musical "Masterpiece" or fulfill a dream to make music. 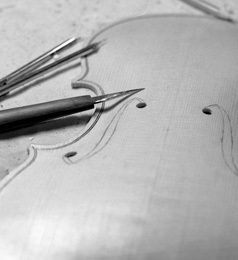 All of my Violins and Guitars are made by hand in my shop. I use hand tools for the majority of the construction process. 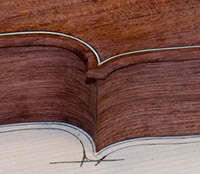 I do use some power tools in the stock preparation but chisel, finger planes and scrapers do 90% of the work. Of course it is much more involved than these few photos can show.